The NCAA tournament for men’s college basketball begins Thursday. Often a Final Four favorite, the Duke Blue Devils are a No. 2 seed in their region – largely thanks to coach Mike Krzyzewski, who’s led the team since 1980. 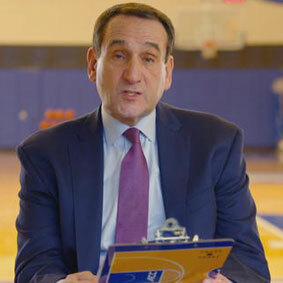 As Duke takes on Iona College Thursday in the first round of the tournament, the man known as Coach K writes a letter to his younger self and shares his historic path to becoming the most winning coach in Division I college basketball. Keep playing those schoolyard games – I know that they are the best part of your day and you might not yet know that they are also important to your future. Those games you play with Moe and rest of the boys are laying a foundation for your future as a member and leader of teams. And the games you play when they have all gone home and you are alone with the ball and the hoop, those are equal in their fundamental value. When you envision yourself in championship moments, counting down the seconds in your head, driving past invisible defenders – you are giving yourself a destination. There will be stops along the way that you could not possibly imagine. Did you know, Mick, that you will be the first in your family to go to college? Did you know that your father, the elevator operator, and your mother, with the eighth-grade education who cleans office floors at night – those children of Polish immigrants – did you know that they are doing those things to ensure opportunities for you and for your brother? You will become a cadet and a basketball player at one of the greatest institutions for leadership in the world. Their encouragement will send you to West Point. And when you grow up, when you become a head coach, first at Army and then at Duke, when you find yourself coaching a team in championship moments, you will feel as if you’ve been there before. Because of what you are doing right now in that schoolyard in inner-city Chicago, you will know what to do. Never underestimate the immense power of your imagination. You will use it all your life. There will be a time in your future, when you are approaching 50 years old, when you will become disconnected with those things you learned in the schoolyard, where it wasn’t always about winning and when the experience and the feeling were what mattered most. The pressure will become heavy and you will feel that burden in your body as well as in your mind. Your family will ask you to take a step away from the team and the game you love. It will be hard, but please listen to them and let them help you reclaim the part of yourself that finds joy and meaning in the process and that understands the importance of balance. And Mick, take it easy on your mom, OK? It won’t be long before you realize that she is your first hero. Your passion for creating opportunities for the next generation begins with her, as does your sense of humor. Watch her. Listen to her. She is selfless and courageous. For whatever reason, life will be good to you. It will offer you many opportunities, and you will do your best to make the most of them. Your ability to seize those opportunities lies in what you are doing right now and the people you have around you. Please pay attention. You will be talking about that schoolyard a half-century from now. You will still be able to feel the pavement beneath your feet and experience the joy of the countless celebrations of imagined victories. You will tell stories of your mother’s courage to locker rooms full of athletes and gymnasiums full of hopeful high school graduates. You’re not going to believe how lucky you are.